Osman Umarji is a fifth year doctoral student in the Learning, Teaching, Cognition, and Development (LTCD) specialization in the School of Education. Osman’s research agenda revolves around the dynamic nature of motivation, including the role of values, goal setting, and self-regulation on behavior. He also interested in positive psychology, particularly in the development of character strengths and moral beliefs. 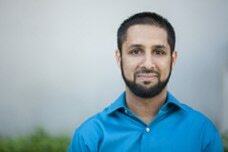 Osman previously received his B.S in Electrical Engineering from UC Irvine and worked as a systems engineer at Broadcom Corporation in mobile phone development. He then traveled across the world to Cairo, Egypt to study Arabic and Islamic Studies at Al-Azhar University in the School of Islamic Law. He is a religious educator and educational consultant. Osman is married and has three children who are the joy of his life. He enjoys playing basketball, hiking, and spending time with his family. Umarji, O., McPartlan, P., & Eccles, J. (2018). Patterns of math and English self-concepts as motivation for college major selection. Contemporary Educational Psychology, 53, 146-158. Umarji, O., Xu, Y., Yu, R., Yang, M., Zargar, E., Day, S., & Connor, C. (2018, May). E-book Affordances: An Intervention for Digitally Scaffolding Young Readers. Paper presentation at Digital Learning in the Humanities and Beyond, A UC Irvine-Tel Aviv University Symposium. Umarji, O. (2018, May). Studying Behaviors and Experiences in Real-Time: Different Types of Big Data. Workshop at Digital Learning in the Humanities and Beyond, A UC Irvine-Tel Aviv University Symposium. Umarji, O., & Eccles, J. (2018, April). Patterns of Math and English Self-concept as Motivation for College Major. San Francisco. Paper accepted to the Associational for Psychological Science annual meeting. San Francisco, CA. Umarji, O., McPartlan, P., & Eccles, J. Dimensional Comparisons of Academic Values and their Associations with College Major Selection. Poster accepted to the American Educational Research Association annual meeting. NY, New York. McPartlan, P., & Umarji, O. (2018, April). “Fitting” sense of belonging in an Expectancy-Value framework: Directionality and development among first-year college students. Poster accepted to the American Educational Research Association annual meeting, New York, NY. Umarji, O., & Eccles, J. The Development of Adolescents’ Math and English Self-Concept Patterns and their Associations with College Major Selection. Paper presented at American Educational Research Association annual conference. San Antonio, TX. Umarji, O., McPartlan, P., Rutherford, T., Dicke, A.L., & Eccles, J. (2016, April). How the fish pond feeds the STEM pool: Middle school class composition associates with self-concept and choice of STEM major. Poster presented at the Society for Research on Adolescence biannual meeting, Baltimore, MD.